David grew up in New Hampshire and is drawn to Victorian architecture. 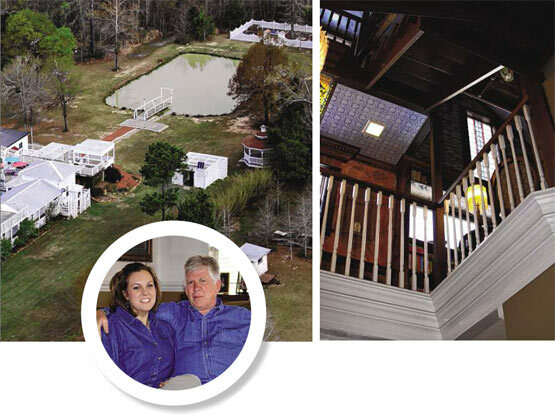 When he and his wife, Stacie, began building their dream house in Lumberton eight years ago, they didn’t intend to turn it into a business. But when their daughter, Lyndsey, moved out, they began to think about converting the spacious home into a bed and breakfast. Two years ago they officially opened the Book Nook Inn. 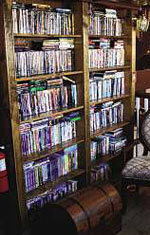 The Book Nook Inn may not be very nookish, but it is bookish. Both Hearnes have connections to the world of books beyond enjoying reading. Stacie developed a website business for book reviews called AuthorReadings.com to help selfpublished and new authors have a wider audience. David has written one book on programming concepts, two political thrillers and has a new book of short horror stories coming out soon. The two hope to position the Book Nook Inn as a writer’s retreat. David, who loves listening to audiobooks, also has plans to create a recording studio within the house to appeal to authors wanting to record audio versions of their books. Set on six acres of land, the large, U-shaped house has a three-story entryway with fiber optic stars twinkling in the ceiling. The detailed trim work, stained glass and Victorian antiques set the theme. In addition to their own master suite, the Hearnes have four rooms they rent for bed and breakfast. Each large room has a bathroom that includes a whirlpool tub. The Hearnes recently opened the “steampunk room” in the tower addition which has an eating/ working nook. “People comment on how homey it feels here,” Stacie said. Stacie and David work hard to create that casual environment, stocking rooms with books, snacks and toiletries. Naps on the couch or reading the newspaper on the porch are encouraged. 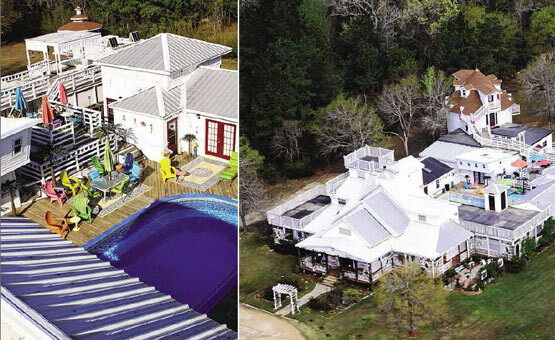 Having a pool, hot tub and fishing pond are unusual amenities for a B&B, as are the home entertainment options. The theater room has surround-sound and is stocked with movies and snacks. The pool table is center stage in the entertainment room, but a treadmill and television are available, too. And there really are fish in the pond – a young guest recently caught at 32-inch catfish. The Hearnes were initially surprised at howmany of their guests were international travelers. They’ve had several guests from Europe, Africa and Australia. 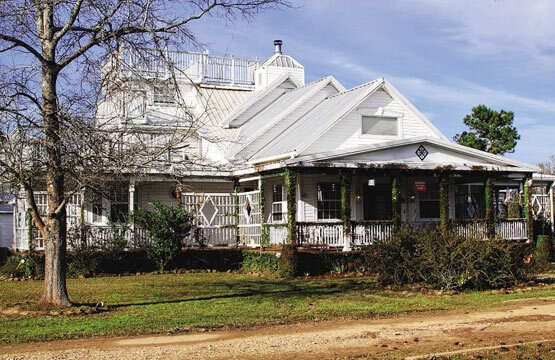 The Big Thicket National Preserve, Village Creek and birdwatching are the most common draws, though they’ve also had guests attracted to the musical history of the area. If steampunk hasn’t crossed your cultural radar yet, perhaps the simplest definition of the genre is “retro-future.” What began as a subgenre of literary fiction has become a pop culture movement that celebrates the Victorian era – with an edge. The science fiction/fantasy/horror literature owes a lot to authors such as Jules Verne, H.G. Wells and Mary Shelley. However, steampunk has evolved beyond literature to fashion, movies, stage sets, décor, cosplays and conventions. Steampunk is a synthesis of the Victorian era and the modern era: Think top hats and corsets, driving goggles and timepieces, airships and unicycles. Steampunk celebrates the gadgetry and technology of the Industrial Revolution. A troupe of steampunk performers, Airship Isabella, has performed on stage and in the parades at Galveston’s annual Dickens Festival for the last two years. 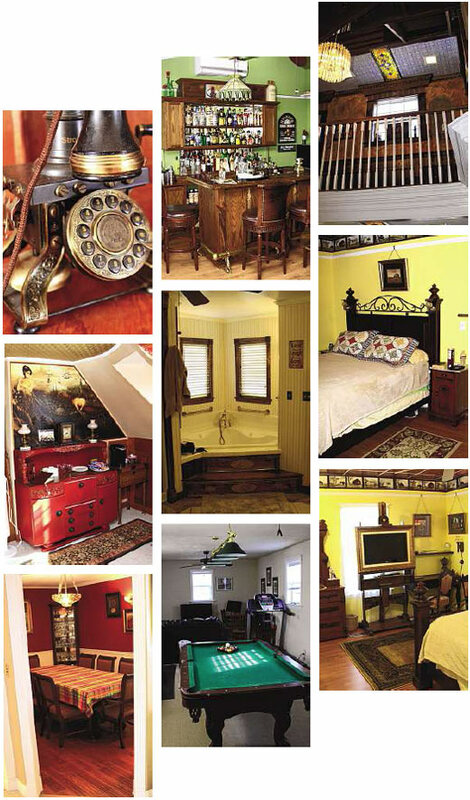 In creating the steampunk room at their inn, the Hearnes looked for ways to put in details with a twist: A faucet shaped like a dragon’s head, a television cabinet with gramophone horns for speakers. David, who also works outside of the inn designing websites and creating software, enjoys the diverse collection of people passing through, all with tales to tell and an interest in Texas and America. “We sit around the table and solve all kinds of worldwide problems, in fact,” he jokes. Thus far, they haven’t had any trouble from guests and count their blessings on that score. The biggest problems that have come up so far are the occasional late-night, lastminute reservation and the individuals who miss the appointed breakfast time but still want full service. The Hearnes have security cameras and do due diligence to verify identification when reservations are made. One skill that is very important is being Internet-savvy. 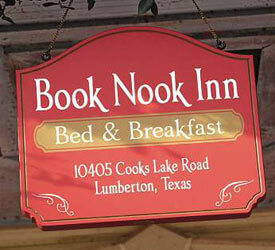 The Book Nook Inn is listed through several travel search engines and reservation operators such as Priceline. Each must be monitored and updated constantly. The second “B” stands for “breakfast” and guests do rate their stays on the meal, too. Stacie’s breakfasts differ with the seasons, but French toast is a standard. She’s made sour cream banana pancakes, pumpkin waffles, carmelized grapefruit, a farmers’ market scramble, a Southern Texas casserole and omelets. David’s contributions in the kitchen are eggs Benedict and a hashbrown creation that involves apples. Stacie sometimes makes additional treats, such as homemade scones or applesauce. 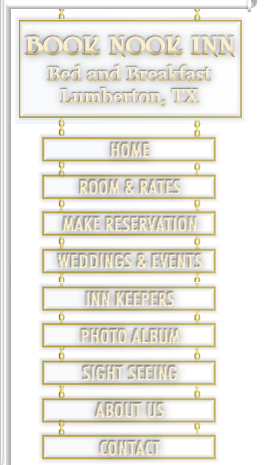 The inn has also hosted private parties for different occasions, such as baby showers and birthdays, and Stacie has catered for those events. Still new to the B&B business, the Hearnes are still learning. Even so, they are also expanding. They have just opened a new event center for wedding receptions and other parties. They saw a need for a venue option that is elegant rather than rustic. The completed venue holds 80 to 100 people.